Heal Your Puzzle » Blog Archive » Ever Feel You Can’t Move Forward in your Life? 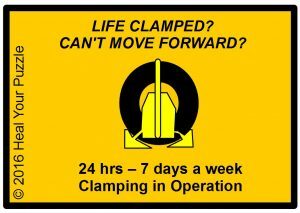 Feel Clamped? Ever Feel You Can’t Move Forward in your Life? Feel Clamped? In my journey professionally and personally, I have come up against obstacles… circumstances and events which have blocked my life path and even set me back a few paces, if not years!? I gave up for a while and lost confidence but eventually reassessed where I was and moved forward, always learning something new from my experience, always a new understanding or technique was found. Every step I take further into the energetic world of who we are, I find new forms and patterns that restrict who we truly are as people. It keeps me striving to find out more and makes me respect the awesomeness of Nature and the complexity of how we as people function throughout our Mind and Body. Recently I came across an Energetic Clamp – this felt like one of those scrapyard cranes clamping my whole being as one of those scrapped old cars and I couldn’t move. With healing thankfully, once you have an image of what’s going on, it begins to resolve itself. What is an Energetic Clamp? When a Clamp forms, it is ready to be released so will usually present itself as a life crisis, moment of dramatic change, realisation or understanding… you may feel completely out of your comfort zone… hang in there… take a deep breath… and allow it to pass… If stubborn, make yourself do something in the ‘real world’ – walk somewhere, do chores, a routine physical activity to keep you in touch with your conscious focus.